Hotel Management is being regarded as one of the best career option all over India. More and more people are seen interested pursuing their career in Hospitality. With the increasing rate of development of Hotels and Restaurants, there is also high demand for Hospitality and Hotel Management professionals. It is being considered as second leading field for study after Information Technology (IT). The students who are looking for graduate course in Hospitality are recommended Bachelor of Science course in Hospitality and Hotel Administration conducted by National Council for Hotel Management (NCHMCT) in collaboration with Indira Gandhi National Open University (IGNOU). NCHMCT is affiliated to Ministry of Tourism, Government of India. The course is done after the completion of 10+2 or equivalent. NCHMCT covers 52 Institutes under it, where admission is done after getting passed in NCHM Joint Entrance Exam conducted by NCHMCT authority. 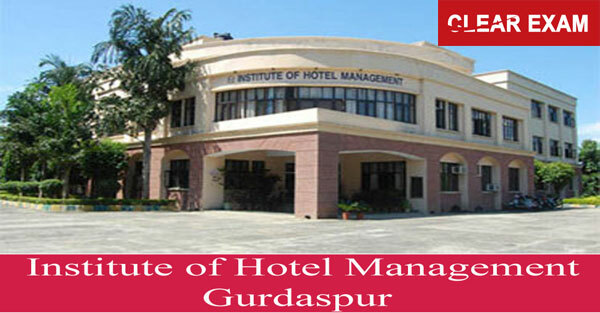 Admission to IHM, Gurdaspur Students who want admission in IHM, Gurdaspur B.Sc. course are required to give NCHM JEE conducted by NCHMCT. The application form for the exam are available from December in both online and offline mode. Students need to fill up the form and send it to the registered office of NCHMCT within the time limit. The exam is conducted in the month of April. Students should carry 2 copy of their admit card to the exam Centre. After the declaration of result, candidates are ranked according to the merit list announced by exam authority. Students are provided the Institutes based on their marks/rank. Further NCHM counseling is done and candidates are allotted with their seat. Facilities Students are provided with the well-equipped labs, kitchen with indigenous equipment. There is also one library for the students to increase their knowledge in their field of study. Students are also provided well-furnished hostel rooms separately for boys and girls. Placements Students are also provided best job opportunities after their course completion. The Institute provides campus placements to the students. Some of the companies are McDonalds, The Lalit, Oberoi and etc. For further queries regarding IHM, Gurdaspur courses, fees structure, etc. students can check it in IHM, Gurdaspur Students can also check information regarding NCHM syllabus, books etc. in our latest articles on Hotel Management at Success Mantra website.